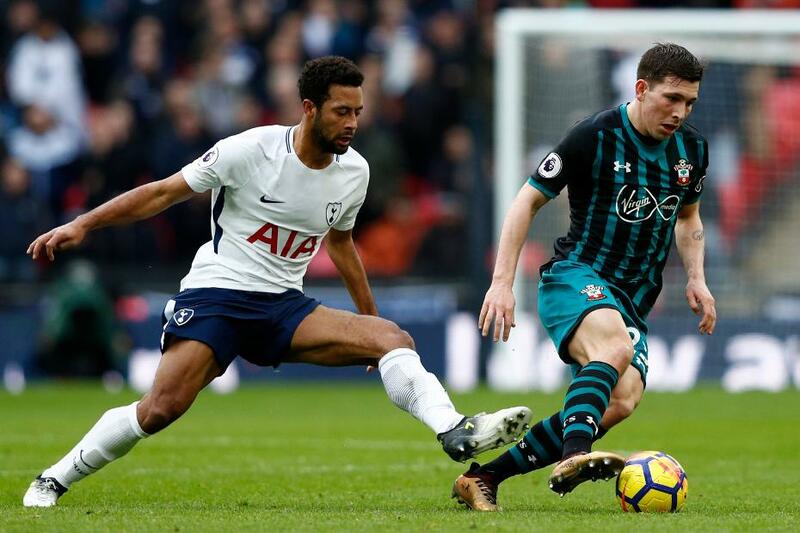 Pierre-Emile Hojbjerg and Mousa Dembele are two gifted central midfielders who have not started as many Premier League matches as they would have hoped this season. Back in favour with their respective managers, and injury-free, their head-to-head at St Mary’s Stadium could be pivotal to the outcome of Southampton v Tottenham Hotspur, writes Adrian Clarke. Hojbjerg had to wait until 26 November for his first start under Mauricio Pellegrino, but he has caught the eye ever since with a series of composed displays in the heart of the pitch. He was especially outstanding against Everton, Arsenal and Manchester United, exhibiting outstanding qualities on and off the ball in all three matches. Demanding his team-mates to play through him as often as possible, the former Bayern Munich man produced the most passes for Southampton in each encounter. Against a trio of strong opponents he did not give possession away cheaply either. Despite trying to play a forward pass through the lines as often as possible, Hojbjerg never dipped below a passing accuracy of 91%. When creating turnovers he was just as effective. The 22-year-old won possession back for his side more than anyone else in each of those three matches, seizing on second balls, making several interceptions and winning numerous tackles. On his day he can deliver top-quality, all-round performances in central midfield. Mauricio Pochettino has openly described Dembele as a "genius" but niggling issues with the Belgian’s foot, ankle and hip have meant his manager has been forced to handle his game-time with care this term. Early on in 2017/18 Dembele failed to live up to his usual standards. Clearly hampered by physical problems the midfielder did not complete a full 90 minutes from late August to early December. The 30-year-old returned to form with a starring role in the 5-1 defeat of Stoke City in early December. He made 69 successful passes inside the opposition half that day, 26 more than his closest team-mate Christian Eriksen, and has looked much more like his old self ever since. Alongside Eric Dier last weekend he was absolutely superb in the 4-0 home win over Everton. The Belgian regained possession 16 times, double anyone else in his team, and passed with an incredible 97% accuracy as he asserted a firm control over proceedings. While Dembele has the bigger reputation, this central contest could be a close-run affair. Based on this season’s performances the stats tell us there is not a lot to choose between these efficient, but stylish midfielders. Hojbjerg’s ability to break up play and then pierce the lines with a positive burst or pass is very similar to the strengths Dembele displays for Spurs, and his game is developing all the time. Neither man is likely to grab the headlines, but how they perform against one another is likely to have a major impact on what happens on Sunday afternoon. The player who retrieves and retains possession most effectively will wrestle control of the contest in his side's favour.